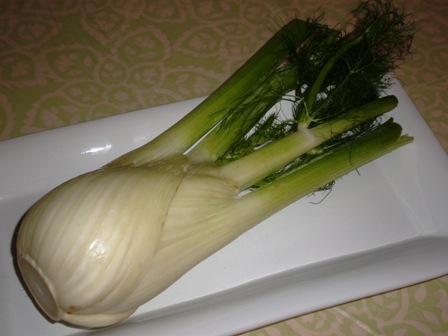 Trim the stems and fronds from the fennel and trim a thin slice from the base of the bulb. Cut the bulb in half and remove the triangular piece of core from each half. Slice each fennel half crosswise into 1/4-inch thick slices. Set aside. Heat the olive oil in a large saucepan over medium heat. Add the onion and sauté until golden, about 3 minutes. Add the tomatoes, season with salt and pepper, and simmer for 5 minutes. Add the fennel and cook, stirring often, for 10 minutes. Add the broth and carrots; bring to a boil. Simmer for 15 minutes. Add the green beans and simmer for 10 minutes more. Stir in the peas and cook for 1 to 2 minutes more. Stir in the butter until it completely melts and the sauce thickens a little. Check for seasoning. Ladle the stew over mashed potatoes or polenta in shallow bowls. 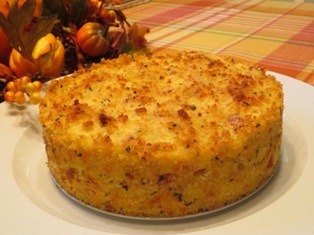 Serve with grated Parmesan passed at the table. Preheat the oven to 450 degrees F. Place the garlic cloves on a small square of aluminum foil; wrap the foil around the cloves. 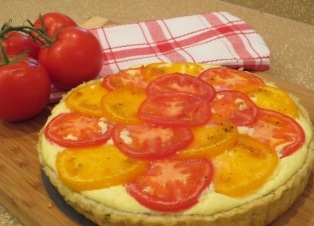 Place in the oven and roast for 35 to 40 minutes, or until tender and golden brown. Squeeze to remove the garlic cloves from their skins and place in a small bowl. Using a fork, mash the garlic until smooth. Reduce the heat to a simmer and cook the potatoes until fork tender, about 12 to 15 minutes. Remove the pan from the heat and drain. Place the potatoes back in the pot and return to the heat. Stir the potatoes for 1 to 2 minutes to dehydrate them. Remove the potatoes from the heat. Add the garlic and butter. Using a hand-held masher, mash the butter and garlic into the potatoes. Add enough milk until desired texture is achieved. Season the potatoes with salt and pepper. This stew is perfect for a chilly autumn or winter evening. The vegetables are added at different times since some need longer to cook than others; the broth thickens as the vegetables soften. A small amount of butter is stirred into the stew at the end to thicken the sauce even further. 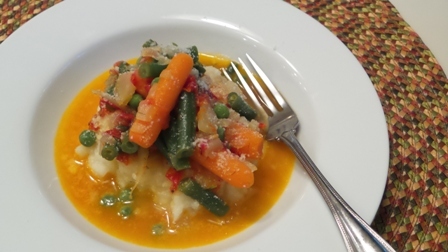 The stew can be served with a crusty bread to soak up the juices or over Garlic Mashed Potatoes or soft polenta. Roasted garlic is all the rage, and for good reason: its sweet, savory flavor adds depth and richness to many dishes and it's an easy appetizer when served with a crusty loaf of bread. WHAT IS FENNEL AND HOW DO YOU COOK IT?